ACS Soundbytes: A free-form fanfic and commentary blog. The good Mr. Chipman of Boston, MA posits questions (amid his usual snark) to the scientific community. We have the means to protect human life in the event of an ordinary car collision, so it's a simple matter of scaling that to account for midair accidents. The automotive industry has the infrastructure to manufacture said Jetson cars. Again, apply existing knowledge to the flying models--and make them fuel-efficient hybrids. We'd no longer need airplanes or cruise ships to visit foreign continents, only passports. Vacation traveling and international work commutes all become cheaper. Moving to another country. Air pollution would be reduced (with the removal of planes and terrestrial cars). The industries involved would have to account for various birds' migration patterns, but that's doable (and wise). As far as the space program, it's less "John Q. Douchenozzle" demanding an ROI, and more "Suzanne Greenpeace" and "Bobby World-Hunger" not seeing the point of spending money and resources on sending rockets to other planets when we have problems "here at home/on Earth". In truth, the bulk of humanity and the environment's problems stem from the fact that we've simply outgrown the planet. I realize that what I’ve been saying here doesn’t sound like my usual optimism. But the reason it doesn’t, I think, is that most people don’t understand what’s meant by “space humanization.” Some of you are probably thinking that space travel isn’t going to be a big help with these problems, as indeed, the form of it shown in today’s mythology would not. Almost certainly, you’re thinking that it won’t solve the other problems of Earth, and I fear you may be thinking that the other problems should be solved first. One big reason why they should not is the “narrow window” concept. The other is that they could not. I have explained why I believe the problem of war can’t be solved without expansion. The problem of hunger is, or ultimately will be, the direct result of our planet’s limited resources; though it could be solved for the near-term by political reforms, we are not likely to see such reforms while nations are playing a “ zero-sum game” with what resources Earth still has. Widespread poverty, when not politically based, is caused by insufficient access to high technology and by the fact that there aren’t enough resources to go around (if you doubt this, compare the amount of poverty here with the amount in the Third World, and the amount on the Western frontier with the amount in our modern cities). Non-contagious disease, such as cancer, is at least partially the result of stress; and while expansion won’t eliminate stress, overcrowding certainly increases it. The problem of atmospheric pollution is the result of trying to contain the industry necessary to maintain our technology within the biosphere instead of moving it into orbit where it belongs. In short, all the worldwide problems we want to solve, and feel we should have solved, are related to the fact that we’ve outgrown the ecological niche we presently occupy. I view them not as pathologies, but as natural indicators of our evolutionary stage. I would like to believe that they’ll prove spurs to expansion. If they don’t, we’ll be one of evolution’s failures. Think about it: even if only one billion people leave Mother Earth for the Final Frontier, the pressure will be off said Earth. That number is: if the peoples of Japan, South Korea, the US (which includes me), and most of Europe left to populate the rest of the solar system--if not cruising on a starship to stars unknown. We have the technology to build orbital space habitats, and to make it livable for out-of-shape people (who probably still need to get in shape, but the lack of gravity can only help). Unlike Mrs. Engdahl, I would be happy if I could live on a planet or moon: I want seasons to pass, and proper day and night cycles. Still, her idea has merit. 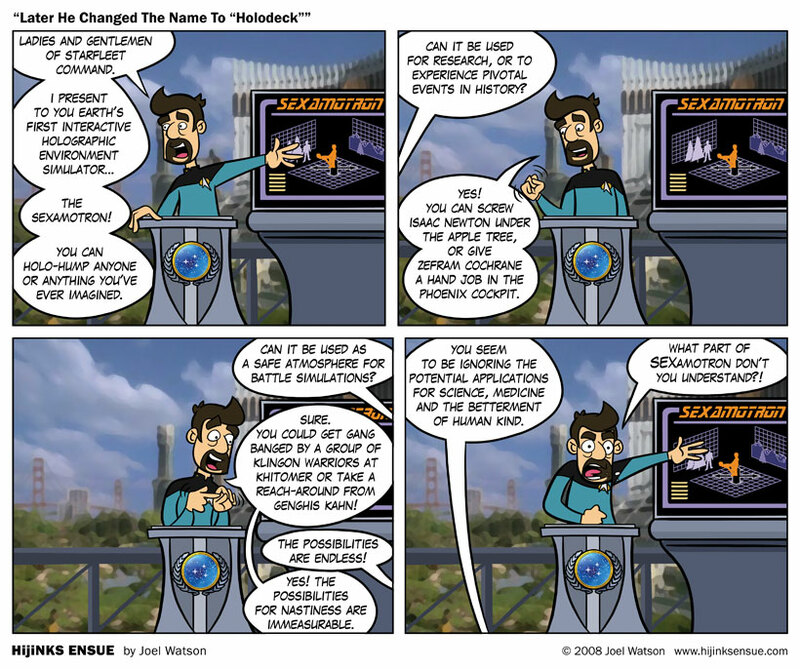 In a future where space travel is mundane, the holodeck would provide a nifty diversion from the everyday grind. In the 21st Century (that is, now), all human progress would grind to a screeching halt. Summary: Space "humanization" and flying cars are needed before the holodeck. Thank you, scientific community. That is all. 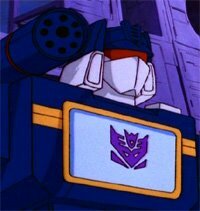 As one of Soundwave's biggest fans, I hope to share my love of Transformers--and animation in general--with you. 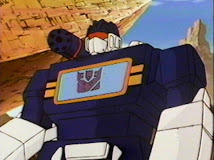 Animation fan, including Transformers. Artist, writer, (currently) government employee and patriot. IRL: Afrimerican: an "African American/not Hispanic" person. I really hate labeling myself like a crayon, but it's needed for the census.